Just a nice simple spice mix for you today. I use 2 tbsp of each then store it in an old spice jar. I generally use about 1/2 tbsp of mix per person for mince and if making fajitas using chicken breast 1 would use 4tbsp instead of one of the packet mixes. Use in place of fajita packets or sauces. I'm using some this week to make some Mexican chicken for the freezer, to make chicken nachos - recipes for both will be up in the next couple of weeks. 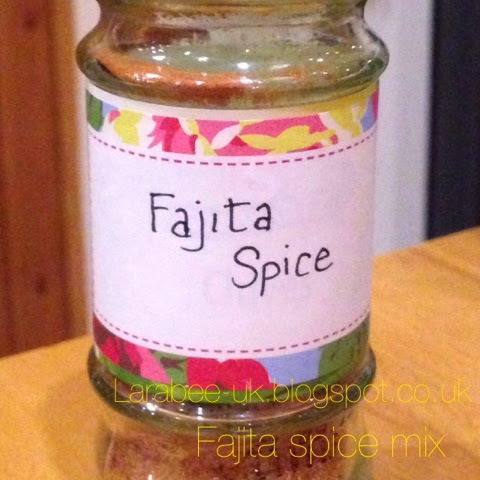 There you have it, why not raid the spice rack and make some fajita mix to add to tonight's chicken??? If you do, please let me know what you think.